The word "mica" is thought to be derived from the Latin word micare, meaning "to glitter", in reference to the brilliant appearance of this mineral especially when in small scales. The mica group of sheet silicate (phyllosilicate) minerals includes several closely related materials having highly perfect basal cleavage. 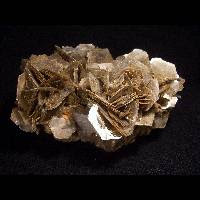 The five most common Micas are: Phlogopite, Biotite, Zinnwaldite, Lepidolite and Muscovite. All are monoclinic with a tendency towards pseudo-hexagonal crystals and are similar in chemical composition. 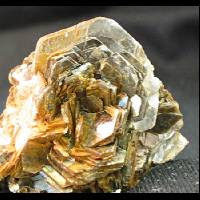 The highly perfect cleavage, which is the most prominent characteristic of mica, is explained by the hexagonal sheet-like arrangement of its atoms. 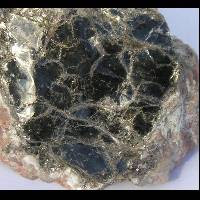 Mica is widely distributed and occurs in igneous, metamorphic and sedimentary regimes. 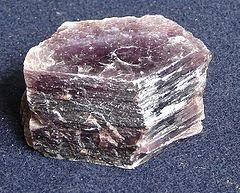 Large crystals of mica used for various applications are typically mined from granitic pegmatites. Until the 19th century, large crystals of mica were quite rare and expensive as a result of the limited supply in Europe. However, their price dramatically dropped when large reserves were found and mined in Africa and South America during the early 1800s. The largest sheet of mica ever mined in the world came from a mine in Denholm, Quebec, Canada. Scrap and flake mica is produced all over the world. Flake mica comes from several sources: the metamorphic rock called schist as a by-product of processing feldspar and kaolin resources, from placer deposits, and from pegmatites. Sheet mica is considerably less abundant than flake and scrap mica. Sheet mica is occasionally recovered from mining scrap and flake mica. The most important sources of sheet mica are pegmatite deposits. Mica has several industrial uses including “Isinglass Mica” which are sheets of mica used as peepholes in boilers and lanterns because they are less likely to shatter compared to glass when exposed to extreme heat. Mica has a high dielectric strength and excellent chemical stability, making it a favored material for manufacturing capacitors for radio frequency applications. It is also used as an insulator in high voltage electrical equipment.